After having a great time in the United Kingdom, Shuchi and I decided to go to our next destination Iceland. 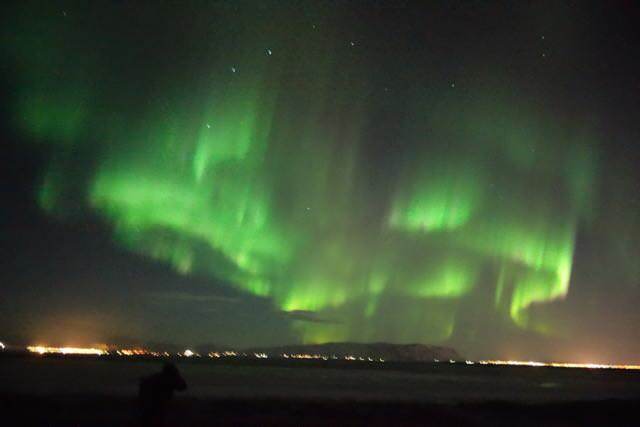 One of the primary reasons for visiting Iceland was to see northern lights. Aurora Borealis or Northern lights is a unique phenomenon where entire sky is lit in green/red color due to the collision of charged particles mainly electrons and protons entering the earth’s atmosphere. This phenomenon mainly happens closer to the north and south poles due to the strong magnetic field of the earth. Lapland in Sweden and Reykjavik/Akureyri in Iceland are few of the best places to observe this near the North Pole. Best time to see Auroras are in winters so we reached Iceland in the first week of December. We boarded the flight from Amsterdam to Reykjavik, the capital city of Iceland. Keflavik International airport is around 50KM from the city area. There are buses constantly running between airport and city center. We landed around 8 pm at night and took airport bus that reached at 9 pm to our hostel. We were very tired because of a long flight – our original flight got delayed due to a bomb threat at the airport – sigh. We initially thought Iceland would be a super cold place but to our surprise temperature, there was more than New York. 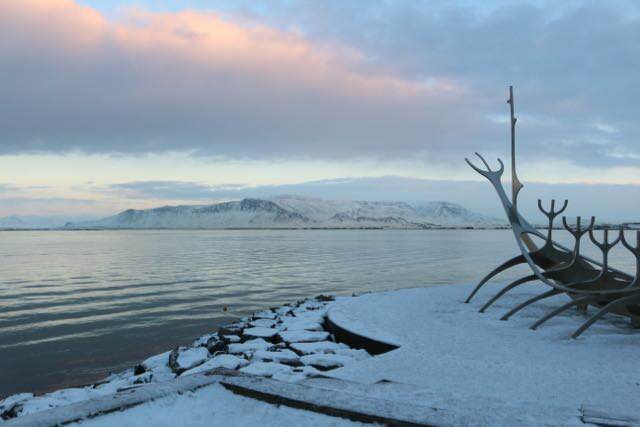 - Typical temperatures in Reykjavik varies from -3°C to 14°C throughout the year. The city of Reykjavik was decorated all over for Christmas. 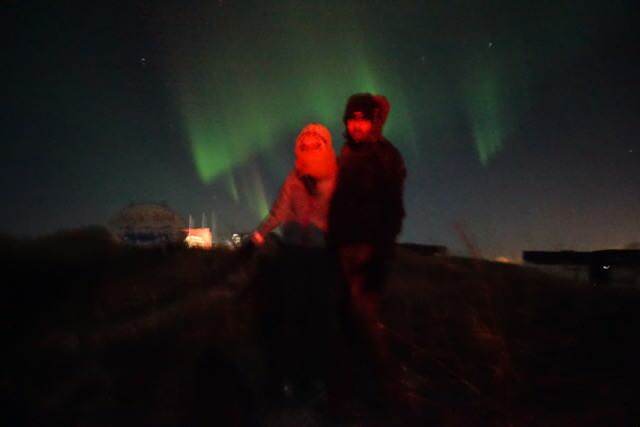 Our initial plan was to see northern lights the day we arrived but our flight got delayed and we missed the last tour. 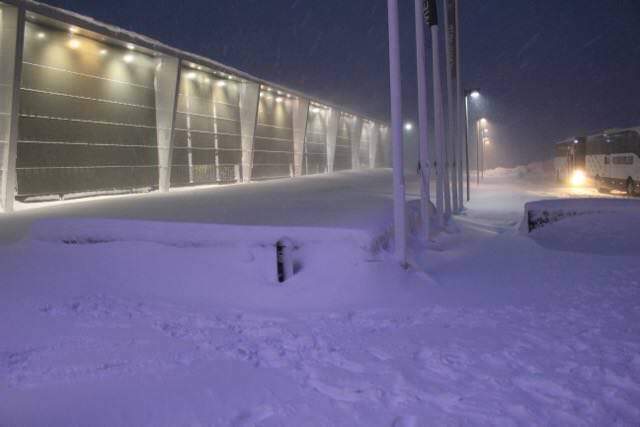 We had plans to take flight for Akureyri next afternoon but because of a heavy snowstorm, our flight got canceled. 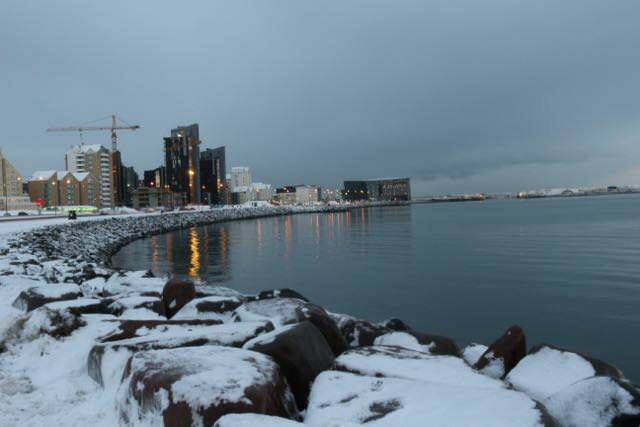 We stayed for a night in the hotel and took that opportunity to explore the city of Reykjavik. 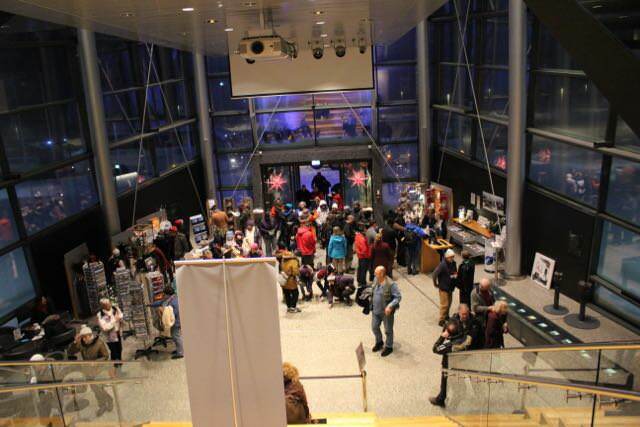 One can easily rent a car or take one of the many bus tours to explore the area in and around Reykjavik. In winters it's dark most of the time – sunrise happens at noon and sets at around 4 pm with roads fully covered with snow. We decided to take a bus tour to explore Reykjavik. On our first day, we had to be in the hotel most of the time because of heavy snowfall. Later at night, we took the Northern Lights viewing tour from Reykjavik excursions (www.re.is). The bus picked us up at 9.30 pm from our hotel – huge group around 60 people in a bus was kind of a bummer but we were super excited to see northern lights. We drove for around 1.5 hours to get away from the city in a dark area for optimal conditions. Around 11.00pm we were in the pitch-dark area north of Reykjavik at freezing cold temperatures. It was very tough to stand outside in open area because of strong winds. Make sure you dress with adequate warm clothes, as nights get very cold especially near mountain areas. We waited for around 2 hours till 1.00 am but there was no sign of Aurora. Unfortunately, we had to return back to the city with no sightings on the first night. All travel agencies let you join the tour for free until you sight an aurora. Next night we again went out and this time weather was good. We waited again for more than an hour at -7°C with strong winds at 20mph. At around 12.30 am a small streak of green light emerged and within a few minutes, the entire sky was full with showers of green light. 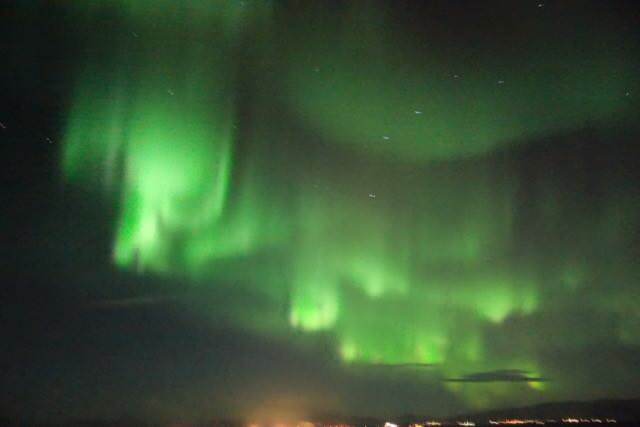 We were very fortunate to see such awesome view of aurora borealis. It was truly an amazing moment – something we would cherish our entire life. We wanted to go north of Iceland to Akureyri so see active volcanoes but our flight keeps getting canceled multiple times due to bad weather. Finally, we had to drop our idea of visiting northern Iceland and decided to explore areas around Reykjavik. Next day we started at 9.00 am and visited Hellisheiði power plant. It is the second largest geothermal power station in the world. This plant is responsible for electricity as well as heating water for Iceland. All hot water in hotel and hostels are heated by geothermal activity – one can clearly smell sulphur in that water. 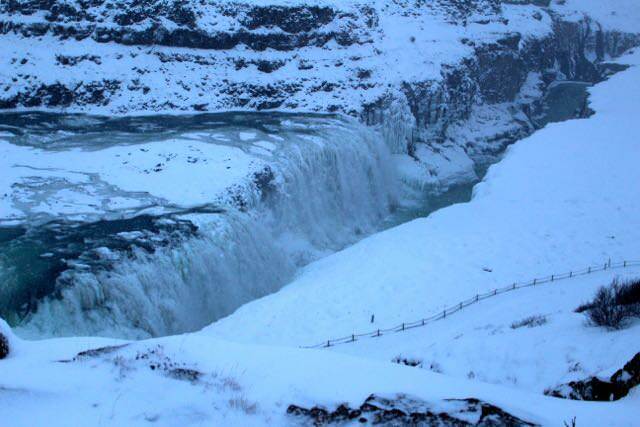 Next, we went to Gullfoss Falls (Golden waterfall) created by river Hvítá that falls from a height of around 30meters. 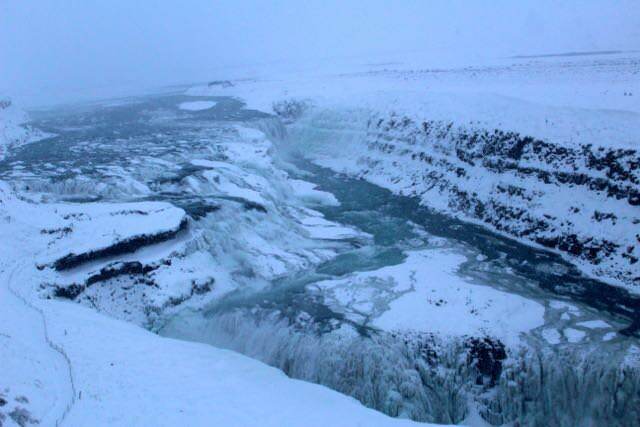 The entire area was covered with a blanket of snow and even the waterfall was almost frozen due to severe cold. After spending an hour and having a great coffee and lunch at their cafeteria it was time for us to visit Geyser geothermal area. Once we reached there, the entire area was steaming with heat, all due to geothermal activity in the area. We walked towards Strokkur geyser that shoots up to 30m in the air approximately every 5 minutes. It was exhilarating to see the power of geothermal forces. 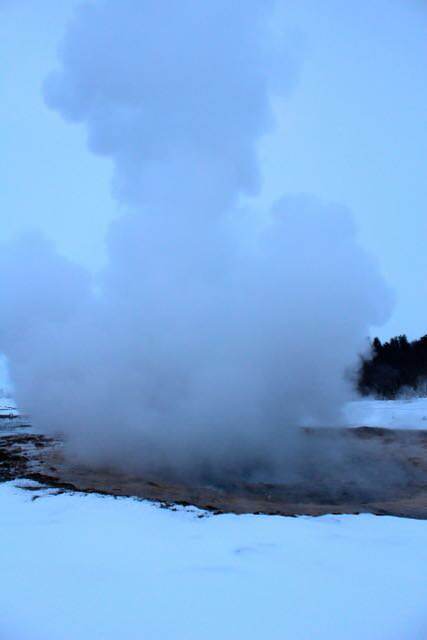 Iceland Geyser from shuchimuley on Vimeo. Next, we visited the UNESCO world heritage site Þingvellir(Thingvellir). 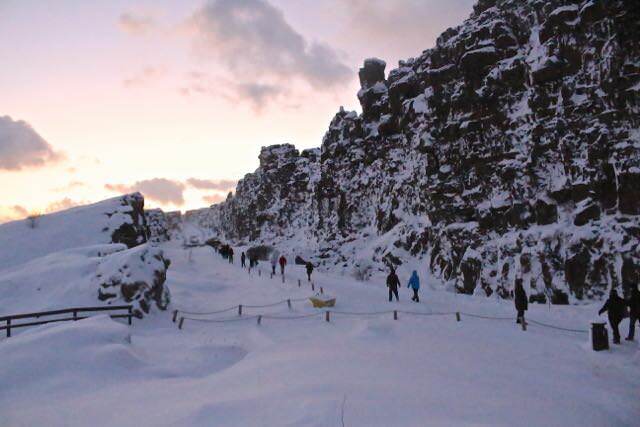 It's a national park with unique landscape between the North American and European tectonic plates.When you walk in the valley you have European tectonic plates on one side and North American plates on the other. These plates are pulling apart at a rate of few centimeters every year. Views from the national park were simply breathtaking. We walked and explored the area for almost 1.5 hours and returned back to Reykjavik later in the evening. We spent two more days in Reykjavik hoping each day for the weather to get better so that we could fly over Bardarbunga volcano to watch the on going eruption. Unfortunately, that didn’t happen and it was time for us to visit our next European destination – Switzerland. Overall we would say that Iceland is a unique country. 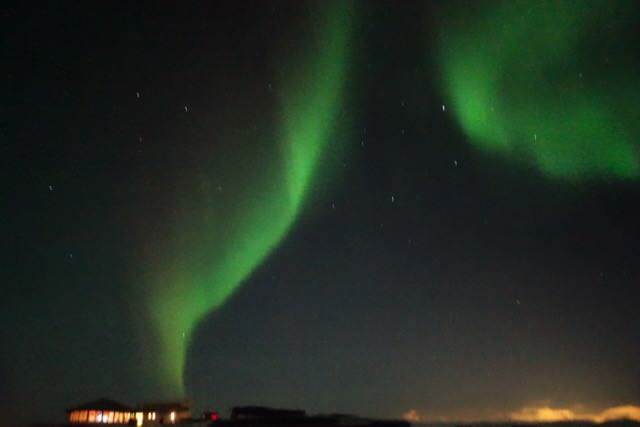 We will never forget the experience of mesmerizing northern lights, our walk along the mid Atlantic tectonic plates and gorgeous coastline of Reykjavik. We will always cherish our visit to Iceland and are sure that we will come back to this beautiful country again.